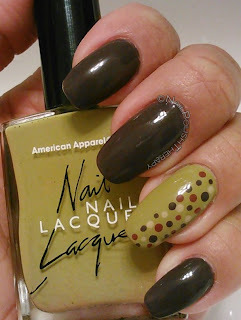 Fall Inspired Dots , My husband was saying to me: Sweetie you have so many fall colors you haven't used, why don't you wear more Fall colors in the Fall? So I dug deep for a couple old Fall colors I had never worn and came up with American Apparel McArther Park and Risk (with no name). McArthur Park is like a perfect avocado color and the formula is so awesome. 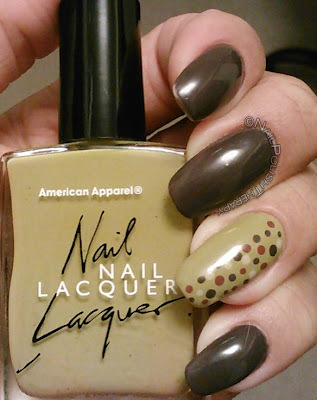 American Apparel makes great creme opaque colors that go on with 2 easy coats, and this was no exception. I could have been fine with 1 coat but I wanted to be sure I didn't have any bald spots. 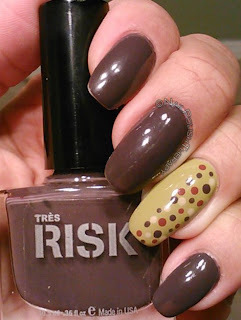 I added dots with Essie Structured, China Glaze Kalahari Kiss and Risk (with no name) for a little pizzazz. I'm happy with how the accent name came out but not so much with the other nails. 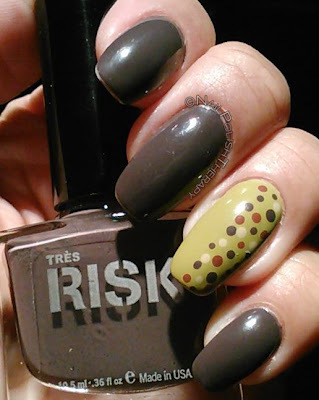 You'll notice tip wear on the other nails and that's because the formula of Risk (with no name) was so thin. It reminds me of Essie nail polish, and even with two coats I barely was able to cover the way I wanted. I left it that way because I was tired when I did my nails that day and I liked the color I have since given Risk (with no name) away to a coworker who loved it. Here it is. Thoughts? Feelings? Concerns?